Ok, I am not a squash person. I have tried for the sake of the kids to put on a brave face and eat it, but it just isn’t my thing. However, these Cran-Orange Acorn Squash are just too cute not to go on my thanksgiving table! Slice off tops of squash and enough of bottoms so squash will sit upright. Scoop out seeds and discard; set squash aside. Combine rice, onion, celery, cranberries and sage in small bowl. Stuff each squash with rice mixture; dot with butter. 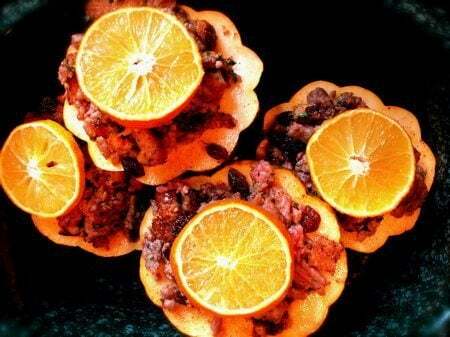 Pour 1 tablespoon orange juice into each squash over stuffing. Stand squash in slow cooker. Pour water into bottom of slow cooker. Cover; cook on LOW 2-1/2 hours or until squash are tender. The skin of squash can be extremely tough! To make slicing easier, microwave the whole squash at HIGH 5 minutes to soften the skin.